We are super excited to introduce a new unique line of products to our Et Cetera Papers lineup, mini foil sheets. 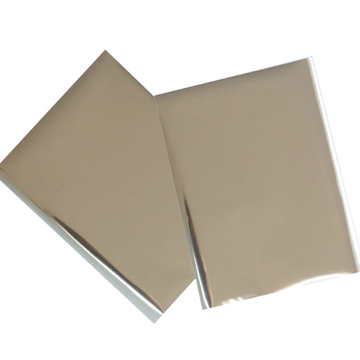 Our foil comes in handy sized sheets for easy handling and quick application. Our introduction to this line includes Silver, Gold and Earth Tone finishes. These Foil sheets transfer without extra tools or heat. 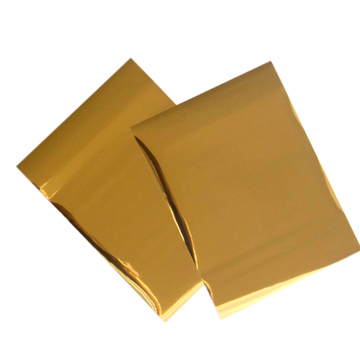 Silver and Gold foil packs each come with 10 sheets measuring 4-11/16″ x 3-9/16″. Decorate with all kinds of adhesive. Apply dull side to the adhesive surface and press firmly. Adding foil is a gorgeous way to make a statement on any project. Did you know you can add foil to your project without a machine or expensive equipment? You can add foil to just about anything with many of the basic adhesives on the market today, the key is the adhesive must be sticky. You can use foam tape, glue dots, rubber cement (once dry) or the best solution … our new 2 in 1 metal nib glue pen! 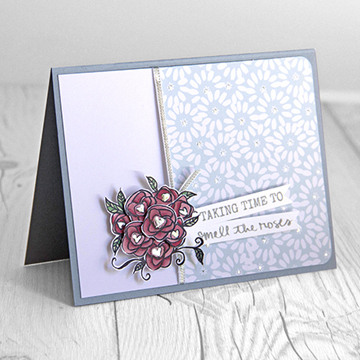 We created this handmade card with a few simple paper crafting supplies. 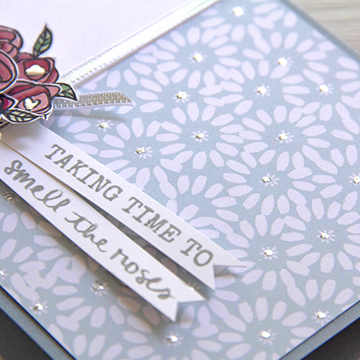 After the card was assembled we added the little hints of silver foil to the flower centers and background pattern. It was so easy to do. 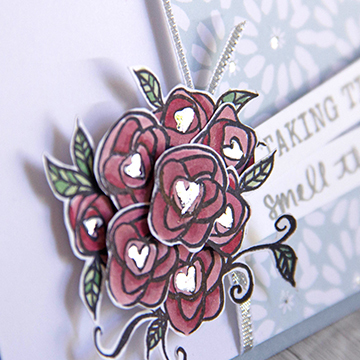 We applied glue to the areas we wanted to foil by drawing directly onto our card with the 2 in 1 metal nib glue pen. Once the glue was dry, we pressed the dull side of the foil directly to the dry sticky adhesive. The foil stuck beautifully and transferred to the card with fantastic results! We love how the silver foil adds that bit of glam and pushes this card to the next level. This entry was posted in DIY Projects, Stationery & Envelopes and tagged Card, Foil, Foil Sheets, Glue Pen, Handmade card, papercrafting, Silver Foil.